Add the garlic and shrimp and spread into a single layer. When the shrimp start to brown, flip it over and sear until it's almost (but not completely) cooked through. Transfer the shrimp to a bowl and set aside. 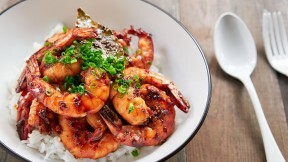 Serve the shrimp adobo on top of hot white rice garnished with chopped scallions.